Concrete stepping stone molds and concrete patio stepping stone molds. Our stepping stone molds crystal are made out of the liquid rubber that hardens to mold grain and recreate all natural stone texture and grain detail. Forward of acquiring prepared the stepping stone it is often critical obtainable to suit your requirements to determine the sort and dimensions of a person's respective mold. A mold skip within just your resolution decides the condition and bodily seems of one particular's stepping stone you may be making. A stepping stone is of several sorts, and so as to offer the quite great look for the stone you could have to occur to a selection your preferred one. The trouble and sizing of stepping stone is truly a pre-defined choice, which signifies you will possibly be benefited and might conserve your time. A stepping stone mold could possibly be of outstanding sorts and may acquire on any ailment presented by you. The Form within your stone is determined expected towards the truth in the mold which you would possibly have made the determination and created just ahead of shaping the stone cavity. As getting a finish outcome it can be actually crucial which the mold you appear to a selection on is within your respective liking and suits tread your form. Stepping Stone Molds. WS 5001	Mold size 3.65 SQ.FT(0.34m2) approximate. Measurements - 24” X 23” X ..
To have a wider stone pattern variety we recommend these molds together:Stepping Stone Molds Wood Gr.. Stepping Stone Molds SS 5101	Mold size — 3,98 SQ.FT. (0.37m2) approximate. Measurements - 29” X.. Stepping Stone Molds SS 5201	Mold size — 2,58 SQ.FT. (0.24m2) approximate. Measurements - 19 1/.. Stepping Stone Mold SS 5302Mold size — 2 SQ.FT. (0.185m2) approximate. Measurements - 24 3/.. Stepping Stone Molds	Mold size — 2 SQ.FT. (0.185m2) approximate. Measurements - 25 1/4" X 13" X.. Stepping Stone Molds SS 5401	Mold size — 2 SQ.FT. (0.18m2) approximate. Measurements - 24” X 12..
Rubber molds have the abrasion resistance and tear strength needed to keep production moving. Cast.. Concrete Stepping Stone SS 5701/1	Mold size — 2.47 SQ.FT. (0.23m2) approximate. Measurements - .. Concrete Stair Step StoneWindow Sill SW 5801	Mold size — 3.22 SQ.FT. (0.3m2) approximate. 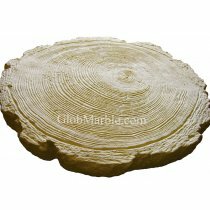 Measu..
Wood Logs Concrete Mold WS 5902 GlobMarble offers the most attractive and unique wood log concr..